A young hafeez of Qur’an that I am acquainted with, who happens to be the son of a very dear friend and who also graces me with the title of a’mu or uncle, recently purchased a Toyota Highlander. He is employed as a graphic artist and is also a skilled Arabic calligrapher and was able to save up enough money over several years to make the purchase outright , thereby circumventing the monthly finance note. In his excitement to demonstrate all of the features that were included in his purchase he mentioned that upon entering the vehicle and starting the ignition, the car automatically recognizes his mobile phone by way of a Bluetooth connection and that allows him to communicate in a ‘hands-free’ environment and thereby not draw attention to himself from the local police. As I entered the vehicle, with its ‘new car’ smell, l readied myself for the 'experience of a lifetime' as promised by my nephew’s enthusiasm, I could not help but think that it would take a lot more than a Bluetooth connection to distance the attention paid to young, black and especially Muslim men by our city’s soldiers in blue. Part of being an ‘old dude’, as my grandson affectionately refers to me as, is the knowledge that any and all attention that is paid to young black men by the police is not a random affair but a very specific part of the ‘policing policy’ used and enforced in every city and municipality in the United States. Ambivalence set in, should I dampen his excitement by directing his attention to studies by the Justice Departmentwhich found that Blacks and Hispanics were three times likely to be searched during a traffic stop than white motorists. Should I mention that Blacks were twice as likely to be arrested and almost four times as likely to experience the ‘use of force’ during encounters with the police. I mean after all, this is just a car ride. I should be complementing him on his purchase and commenting on the comfort and spaciousness of the vehicle’s interior. The smoothness of the ride. I should be saying something that means absolutely nothing just to be polite. But that’s not me. So I’m conflicted. My nephew is a bright kid, he is an answer to the prayers of many of us who could not read a word of Arabic when we became Muslim in the middle 60’s. And here he is, one who has been blessed to read and memorize the entire Qur’an and whose recitation makes 'grown-folk' cry , he's so happy with the technology of this car and all I can think about is the possibility of danger because he will be driving while black. I mean he made it through high school unscathed where black and latino students represent more than 70 percent of the 96,000 students arrested. He also wasn't among the 242,000 kids that were referred to law enforcement agencies during the 2009-2010 school year where currently blacks and latinos make up more than three fifths of the confined youth today. 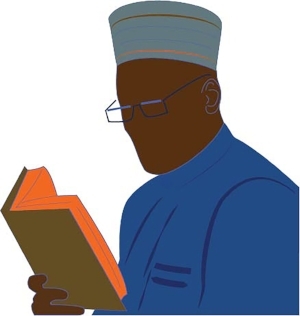 Given his interest in studying the Qur’an and in art in general, Allah saved him from becoming one of those young black men to enter into the juvenile justice system and then sentenced to an adult prison, which by the way happens rarely to white youth accused of the same infractions. And so I bite my tongue. I look around and marvel at the ‘quiet’ in this car. I ask about the brakes and the overall warranty. I want to know what made him choose metallic grey. And at the end of our little spin, I offer him my salaams and tell him to be careful, to remember Allah much and hand him a business card from my lawyer. He asks ,” a’mu, what's this for ?” I said, keep it with you, you’ll never know when it might come in handy.